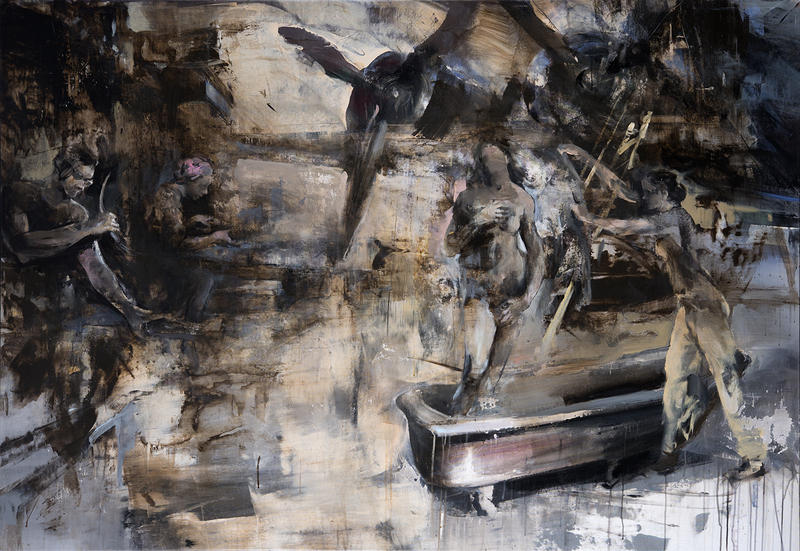 Odon Wagner Gallery is excited to announce the pending arrival of a new work by Zsolt Bodoni. Born in Élsed, Romania in 1975, Bodoni’s art practice references his childhood living under the collapse of communist rule in Eastern Europe. Reoccurring images of somber factory workers and instruments of war are juxtaposed against icons of classical beauty and art to expose the reality of communism’s false utopia. Using hazy washes of paint in a Richteresque fashion, Bodoni’s memories are layered on his canvas; a photomontage of disparate flashbacks unified vis-à-vis his dark impressionistic palette. Receiving his MFA from the Hungarian Academy of Fine Arts in Budapest, Bodoni demonstrates a thorough comprehension of classical mythology and the canons of art history throughout his oeuvre. This cathartic remembrance of Romania’s tyrannical past is not without hope as the artist includes symbols of rebirth flooded with swathes of light. Zsolt Bodoni has been exhibited internationally including the Hungarian Cultural Institute in Brussels, the Boulder Museum of Contemporary Art, the Prague Biennale amongst others, and has been installed internationally in both private and public collections.